The 2018-19 NBA season officially got started on Tuesday night, but only four teams were in action between two games. On Wednesday, however, things really got going. There were 11 games on the docket, including two on national TV, and a number of important debuts. Take a look at all the scores, news and highlights from the night’s action. 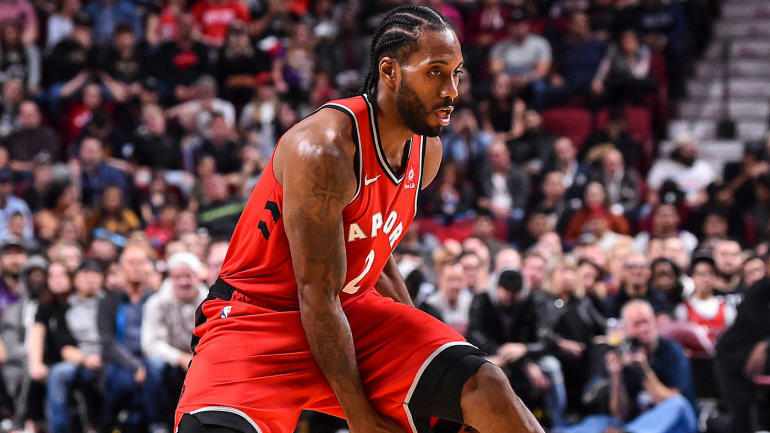 It wasn’t exactly the most exciting bucket he’ll ever score for the Raptors, but Kawhi Leonard is on the board. Out on the fast break, Kyle Lowry made a point to get his new star the ball, and Leonard converted an awkward finish in traffic. Leonard finished with 24 points and 12 rebounds in the Raptors’ win over the Cavs. Kawhi Leonard’s counterpart from the big trade this summer, DeMar DeRozan, was also playing his first game with his new team. And of course it didn’t take long for DeRozan to get his first basket with the Spurs. He did it in classic DeRozan fashion, hitting a mid-range jumper. DeRozan finished with a game-high 28 points, four rebounds and four assists in his first game as a Spur. Yes, Jimmy Butler is still on the Timberwolves, and as he promised, he’s out there for their first regular season game. It didn’t take him long to make an impact either, as he got a nice steal and score. Butler made a late, clutch 3-pointer, but couldn’t bring the Wolves all the way back. He finished with 23 points, seven rebounds and four steals in the loss. The Pelicans made a statement with a 19-point win over the Rockets in an opening night battle between two of the Western Conference’s top teams. Anthony Davis dropped 32 points, 16 rebounds and eight assists, while Nikola Mirotic added 30 points and 10 rebounds in the win. In his first game with the Rockets, Carmelo Anthony was 3-of-10 from the field for nine points, and took some questionable mid-range jumpers. The Bucks were cruising early on against the Hornets, but Kemba Walker led his squad back in the second half to turn this game into a thriller. Giannis Antetokounmpo finished with 25 points, 18 rebounds and eight assists, while Walker went for 41 points. Luka Doncic has his first NBA points. A few minutes into his first game with the Mavericks, Doncic got out on the break with Wes Matthews and executed a nice give-and-go for a layup. It won’t be the most spectacular basket he ever scores, but it will be one to remember. Seems like Devin Booker’s hand is feeling OK. The Suns’ sharpshooter was blistering hot in the fourth quarter, finishing with 35 points on 6-of-10 3-point shooting in Phoenix’s opening night win. Jarrett Allen may have flown under the radar in his rookie season, but he’s looking to make sure that won’t be the case this time around. He’s off to a good start in that mission, rising to reject Blake Griffin in devastating fashion. Is there anything this guy can’t do? Clippers center Boban Marjanovic treated us all to another delightful highlight when he appeared to throw down a dunk with his feet still on the ground.